Children of all ages are one of the most at-risk populations to suffer adverse health outcomes as a result of climate change. There a number of physiological and behavioral factors that make children more vulnerable, such as developing lungs which makes them more susceptible to respiratory hazards. 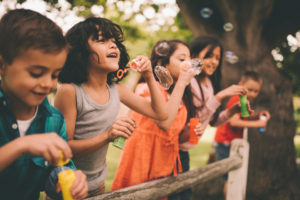 In addition, school aged children spend more time outdoors, placing them at-risk of health illness from extreme temperatures, respiratory harm from exposure to air pollutants, and increased risk of vector-borne diseases from exposure to mosquito and ticks. There are a variety of action items and tools that nurses who care for school aged children can utilize to help prevent adverse outcomes from climate impacts. In schools, ensure education of fellow colleagues, school faculty, and administration of potential adverse outcomes and how these can be prevented. Advocate for incorporation of climate change in school curriculum. For children with chronic conditions, school nurses can ensure that action plans are in place to protect against exacerbation triggers like poor air quality and extreme heat. Nurses can start prevention programs similar to the Heat Illness Prevention School Project, a toolkit created by the Arizona Department of Health Services. The aim of this project is to educate students, school staff, athletic coaches, and parents regarding heat-related illness and prevention. Work with the National Association of School Nurses and school districts to advocate for adequate staffing of school nurses in schools to care for the increasing population of school aged children impacted by chronic diseases. Extreme heat events and rising temperatures lead to elevations of ground-level ozone which can have detrimental effects on children, especially those with respiratory conditions. School nurses are spearheading implementation of Air Quality Flag Programs across the country. Robin Luffy, MSN, RN, PNP-PC, AE-C and Christine Wagner MSN, RN, PNP-PC, FNP, AE-C discuss in their articleThe Expanding Role of School Nurses: An Ozone Awareness Flag Program the partnership between the Texas Asthma Consortium, U.S. EPA, U.S. Department of Health and Human Services, and the Asthma Coalition of Texas in implementing an ozone awareness program in schools in North Texas to educate and prevent adverse outcomes on bad air days. children from the health impacts of climate change. The Center for Green Schools at the U.S. Green Building Council works with school decision makers, community volunteers and thought leaders in the public and private sectors to drive progress at the intersection of sustainability, education, public health and the built environment. Resources and tools that can be used in school curriculum to teach kids about climate change.